Kingdom Crossing | To encourage and strengthen the Body of Christ. A few years ago, I began to experience dizzy spells from time to time. It would usually last an entire day, but I would generally feel better the next day. It happened about one day a month at first. I chocked it up to genetics, as my grandfather had struggled with vertigo during his lifetime, or even hormones, as they can do crazy things to us as we age. The dizzy spells began to come more frequently and more severely over time, and they became more and more debilitating. I woke up feeling dizzy one morning a couple of years back, but I went through the motions of my day the best I could. With four kids, there’s little time to stop and focus on my own health issues. My husband works a part-time evening job, so he was working that evening when I went to lie down on the bed to try to right my spinning world and ease the accompanying nausea. Lying down didn’t help, so I decided to get a quick shower and get ready for bed. While I was showering, I felt an overwhelming sense of nausea, and then everything went black as I fainted and crashed to the floor. When I began to regain consciousness, I could hear my kids banging on the bathroom door, asking if I was okay. I was so weak that I couldn’t speak very loudly, but I was able to ask them to find a key and come in to help me. I don’t know how long I was out of it, but the first thought to enter my mind when I regained my senses was this, “If I die tonight, I’m not afraid because my daddy is waiting for me.” My dad had been killed in a DUI a little over a year before this. I can’t explain the peace that flooded me in that moment, knowing that whether I lived or died that night, everything was going to be just fine. I fully realize that Heaven is about much more than being with my dad again, but the Lord was sweet to give me that thought and the peace that I needed in what would otherwise have been a very scary situation. I was lying naked in my own vomit when my precious 10-year-old daughter was able to get into the bathroom. She helped me off of the floor of the shower and into the tub to wash myself off. My husband Trevor got home while I was in the tub. I could hardly open my eyes, and every time I tried to move, I threw up more. Trevor called my sister, an RN, and she urged him to rush me to the E.R., in case I had hit my head when I fainted. Trevor loaded me into the car. I kept a bucket with me because the nausea wouldn’t let up. When we got to the E.R., Trevor ran in to get someone to help me out of the car. They came out with a wheelchair and rolled me straight to a room. I must’ve looked frightful, because they wasted no time in starting to work on me. Someone immediately came to my bed and took an x-ray of my chest. After that, they rolled me down the hall for a C.T. scan. They had to stop and let me vomit into my bucket before they could even get me into the machine. When I returned to the E.R., the nurse started an I.V. with fluids and meds to ease the nausea. My mom and sister had reached the hospital by this time, and though I couldn’t keep my eyes open for long at a time, I could see that they were terrified. I heard the nurse ask my husband if my coloring looked normal. Apparently, I was a strange, pale shade of yellow. When the I.V. fluids and meds began to kick in, my coloring improved and I began to feel like myself again. The nausea and overwhelming fatigue subsided, and I was able to sit up and talk. It was by this time the early hours of the morning, and I convinced my mom and sister to go on home for the night. The E.R. kept me over night. They performed every test on me that I could imagine. They ran blood tests, they checked my C.T. scan for brain tumors, they did an ultrasound of my carotid arteries, they did an EKG, and so on and so on. I felt like quite the guinea pig. The next day, the doctor came in to release me. Her diagnosis: vertigo. She referred me to a neurologist and sent me home. I was relieved and frustrated at the same time. Vertigo caused all of that trouble and expense? I dreaded to see the bills. The neurologist referred me to a physical therapist to help me with exercises to treat the vertigo. I never made that appointment. I googled some exercises and did them myself at home. They seemed to help a little, but the dizzy spells continued until God revealed the real cause—my diet. I was eating all of the wrong things and not getting enough protein. My body was starving for good nutrition, and the symptoms were getting worse. I completely changed the way that I eat, and the dizzy spells have stopped. I haven’t been dizzy in over a year now. I feel better than I have ever felt, and I praise the Lord for the wisdom that He gives us to fuel our bodies the right way. Have you ever had an experience that made you really think about entering eternity? Looking back on my night in the hospital, I realize that I wasn’t truly near death. At the time, however, no one knew what was wrong with me, and the flurry of activity around me in the E.R. was certainly unnerving, especially for my family. I wear this verse on a bracelet that my friend gave me, and I have it on a plaque above my fireplace. I cling to this verse and believe that it’s true, even when it doesn’t feel true. That’s what faith is all about—believing God instead of our circumstances. Our circumstances can really stink sometimes. Our loved ones can be killed; we can struggle with health problems; financial disasters can devastate us; rebellious children can break our hearts; the list is as long as there are people on the earth. But God is good, and His plans for us are good, and He will never leave us. He is trustworthy through the best of times and the darkest of times. And though I want to live on this earth long enough to raise my children and enjoy my future grandchildren, “If I die tonight, I’m not afraid.” Can you say that, friends? I have some thoughts swirling around in my head this morning that I need to get out. I was up early with a sick child, and when I lay back down to try to sleep again, these thoughts compelled me to get up and write. I believe that someone needs to hear this today. When I have trouble sleeping, I usually pray. I figure that if I’m awake in the middle of the night, God wants me to spend that quiet time with Him. Often, those prayers are for my loved ones who are far from Him. My heart breaks for those who are missing out on the relationship that I have with my Heavenly Father. Many people are having difficulty reconciling a God of love with the reality of Hell. We’ve all heard this argument, or maybe you’ve used it yourself: If God is really loving, there’s no way He could send people to Hell. I agree, and here are my thoughts about it. God truly is love. Absolutely. No doubt about it. He demonstrated that in a way that I would dare say very few of us could have done. He sent His Son to die for us. Could you do that? Could you allow your child to be brutally murdered to save people who are mean and cruel and vile and backstabbing and rude and gossipy and murderous and downright sinful? I couldn’t. There’s no way. But God did. You know why? Because He loves us more than our human minds can even comprehend. And not only that, but He wants to hang out with us forever. And ever. And ever. That’s a super long time. So God did the hard part. He sent His Son out of the perfection and comfort of Heaven to be tortured and die. Why? Because Jesus was the only person who ever walked the earth and didn’t do anything wrong. He never sinned. Not one of us could say that about ourselves. Even those who don’t buy into sin and Hell know that they’ve done bad things in their lives. We all have. Because God is a just God, He can’t be with us if our hearts are rebellious and dirty. We need a sacrifice in order to be forgiven, or in other words, to bridge the gap between us and Him that is created by our sins. Jesus became that perfect sacrifice—once and for all time. He paid the price for our sins so we don’t have to. Not only does God want us to spend eternity with Him in Heaven, but He loves us so very much that He wants our lives on this earth to go well, too. He has laid out in His Word some guidelines for how we should live. Just like we, as parents, want our children to be safe and healthy and happy, so we have rules and guidelines for how they should behave. God, as a loving Heavenly Father, gives us many guidelines in His Word for how we should live our lives—not to keep us from having fun or to put a damper on our lives, but to protect us. It’s very much like when we, as parents, see danger that our kids can’t see. We might restrict them from activities that we know are harmful, and they might think we are mean or prudish. In reality, we are protecting them because we know better than they do what is good for them. When we stray from God’s guidelines and disobey His rules, we suffer. He doesn’t punish us; there are simply consequences when we live outside of the good guidelines that He set out for us. When we go our own way and think our ways are best, we often hurt ourselves and we hurt others. Along those lines, God doesn’t send people to Hell. People choose Hell (a place of torment and eternal separation from God) when they reject God and His ways. Many people are “wise in their own eyes” and think they know what’s best. Instead of trusting the God who created them and provides for them and loves them, they go their own way and try to satisfy their deepest longings apart from Him. But do you know what? It’s impossible. We can’t fill the holes in our hearts with anything except God. It simply doesn’t work. I totally get that life is hard and it downright stinks sometimes. We live in a broken, fallen world that is full of pain and heartache. Many people experienced unthinkable pain as children, and Satan has used those wounds to make you believe lies. Some of us have had horrific tragedies thrust into our lives—things that we didn’t ask for or deserve. But God doesn’t cause the pain. Instead, He made a way for us to live forever in a place where there’s no pain. But we have to choose in this very brief life that we’re living now whether we will live with God for eternity or apart from Him where the pain will never end. He won’t force us to choose Him. And once our hearts stop, it’s too late to change our minds. There’s no do-over once we’re dead. So if you’ve been struggling with some of these things, I urge you to “Seek the Lord while He may be found.” Run to Him with your hurts and your questions and your doubts. He adores you and longs for a relationship with you. He wants to heal you and fill you with joy and peace and contentment. Doesn’t that sound amazing? Won’t you join me there? I was a student at North Georgia College in the mid-90s. The campus was about an hour’s drive from my parents’ home. Because my grandparents lived about half as far from school, I stayed with them during the school week, to make my commute shorter and cheaper. Then I went home on the weekends. One day after class, I got to my car to head back to my grandparents’ and found a note from my dad, scribbled on the back of his business card and slid under my windshield wiper. He was a licensed professional counselor and was working that day in the area where my college was located. He had taken time out of his schedule that day to weave through the large college parking lots and locate my car so he could let me know that he was thinking of me and loved me. It has been over 20 years since I found the note on my car, and I have kept it secure in the bottom drawer of my jewelry box ever since. In other words, I have treasured it. After my dad was killed in May, I searched through boxes and containers of “stuff” that we have stored in closets and behind knee walls. 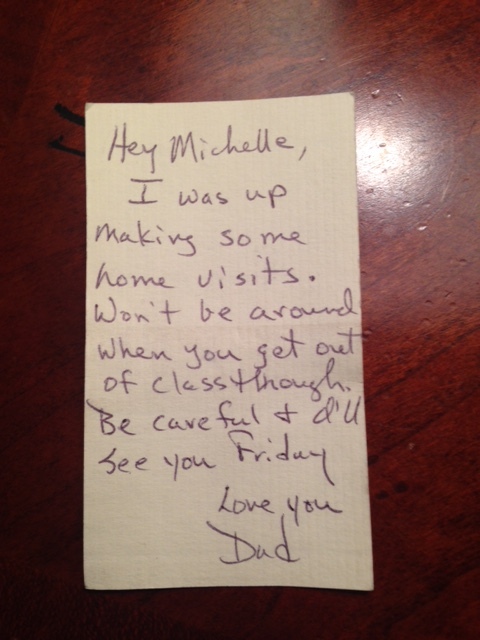 I was desperate for more written notes from my dad, specifically to me, telling me that he loves me. I found a couple of cards that he wrote to my husband and me early in our marriage, thanking us for contributing to his mission trips to Peru. He also wrote the inscription on a Bible that he and my mom gave me for Christmas one year. I’m sure there are other notes from my dad that I have yet to find, but by and large the birthday cards and inscriptions and notes and such were written by my mom. Of course I treasure those also, but like all daddy’s girls, this one craves written affirmation and encouragement and love from her daddy. My encouragement to dads today is to be intentional about writing notes to your children. Write on their birthday cards some of the time. Scribble an “I love you” on the napkin in their lunchbox. Keep a journal for each child, and write to them in it occasionally, telling them how special they are and what you enjoy about them (this is something that my husband and I have been doing since our children were born). If your children are already grown, mail them a “Thinking of You” card and tell them how proud you are of them and how much you love them. Those little intentional acts of love might mean the world to your children one day. I realize that these sappy kinds of things come naturally to moms and not so much to most dads. And I know that life is busy and it’s easy to forego the little extras. But please take a few moments occasionally to write special things to your kids. Life is a vapor, and we never know if we will have tomorrow. Thankfully, our Heavenly Daddy wrote many amazing love notes to us in His Word, and we can draw comfort and strength from them always. “I have loved you with an everlasting love. It’s been four months today since my dad was killed in a hit-and-run crash. He was cycling near his home on May 4 and was hit from behind by an intoxicated motorist (who was later apprehended). Dad was killed instantly. As I wrote a month after the crash, my dad was my rock, and our whole family is trying to pick up the pieces of our lives and figure out how to go on without him. In the days and weeks after Dad was killed, I wondered if there would ever come a time when I didn’t think about him every waking moment of every day. My friend, whose father was killed in a mining accident years ago, assured me that the day would come when I wouldn’t dwell on his death each moment. Thankfully, she was right, and I’m at least able to function now. These four months have been, hands down, the hardest of my entire life. I’ve cried daily for four months straight. I try to keep the tears inside until I’m alone at night…often in the shower. There the tears can flow and I can pour out my hurts and heartache to God without upsetting anyone else. Sometimes, out of the blue it hits me that Dad is really gone, and it feels like I’ve been punched in the stomach. At this point, I don’t know when the tears might stop. I want to discuss some of the things that I’ve learned about grief in these four shorts months that I’ve been on this road….the good, the bad, and the ugly. And believe me, parts of it are ugly. The “experts” say that there are stages of grief, such as denial, anger, bargaining, depression, and acceptance. I can’t point to specific stages that I’ve been through; maybe that will come in time. I just know that it hurts. And it’s messy. And I’ve run the gamut of emotions from one day to another or even from one moment to another. “A time to grieve and a time to dance.”? Where’s the hope that this pain won’t last forever? Going back to our homeschool academy last month was almost torturous for me. Dad was one of our middle school teachers, and I’m the school administrator. I spent well over 600 hours with Dad at school in the past year alone. When I’m there I can almost hear his voice coming from his classroom across the hall from my office. I can almost see him walking down the hall in his slow, confident gait. I can almost smell his cologne on my children’s clothes, because they would greet him with a hug each morning at the beginning of school. Thankfully, I had the summer to work through some of the emotions, and I try to put on my “happy face” every day at school, but it’s still very difficult even to look in his classroom. Another really stinky aspect of this has been imagining the actual crash in my mind. I know enough details from visiting the scene of the crash and from speaking with the state patrol officer and some of the witnesses to know that my dad died a terribly violent death. I know that I shouldn’t dwell on such things, but it’s very hard to keep my mind from going there. When I sink into that awful train of thought, I have to pull myself out of it quickly by thinking about other things. It’s been helpful to have my kids around, because they keep things upbeat and are a distraction when I’m tempted to sink into the mire of the tragedy. Anger has been a prominent feeling for me over the last few months. I wouldn’t say that I’m stuck in the anger “phase” of grief, but I experience angry moments off and on, out of the blue, for no apparent reason. I’ve screamed at God for taking my dad away. I’ve screamed at the man who killed him (well, not really “at” him because I’ve never spoken to him, but in the privacy of my home). I’ve been mad at Dad for riding on a busy road. I’ve been less than patient with my children at times, because it’s been hard to keep the anger from flowing out. I’ve had little patience with senseless quarrels and the insignificant squabbles of others. It’s as if I’ve crossed over a line. I can see now what’s truly important in life, and I don’t want to spend my time and energy on trivial issues that have no eternal value. I’ve been reading a book called Forgiving the Unforgivable. The author lost his father, grandmother, and great-grandmother to a drunk driver about 20 years ago, and he discusses the process of forgiving someone for something that caused so much pain. He says that it took him a long time (years) to come to the place where he could forgive the driver. In fact, for some time, he wanted the driver to die for what he had done. To say that I’ve forgiven the driver who killed my dad would be true and false. When he comes to mind, I have to make a conscious choice to forgive him, over and over again. I think it’s a process that we have to go through, of releasing the perpetrator in our minds and praying for him or her until we finally feel no ill will toward the person. I do pray for the man who killed Dad–I pray for him often. I pray that he will come to know the Lord through this tragedy. If this makes any sense, I don’t want my dad’s death to be wasted; I want Dad’s life and death to lead his killer to Christ. I know without a shadow of a doubt that if Dad had been given the choice to die so that his killer would gain eternal life, he would’ve willingly given his life. (Who knows? Maybe Dad was given that choice in the instant before he was killed.) Wouldn’t that be how God operates? To use something absolutely horrific to bring about something eternally awesome?! Our family still has a long road ahead of us. We’ve already been through one hearing with the driver, and another is scheduled for December. He hasn’t even been indicted for the crash yet, so the trial is still many months away. We will likely re-live the tragedy and loss over and over again through the legal process. One thing that I’ve experienced since Dad’s death is a loss of fear. I’m no longer afraid of death and dying because my daddy has gone before me. It’s comforting to know that He is in heaven holding the babies that my sister and I miscarried until we get there and can hold them ourselves. He was an awesome Papa to his 11 grandkids here on earth, and he’s being an awesome Papa now to the three who are with him in heaven. Another positive is that I’ve lost some of my shyness about talking to others concerning matters of faith. I’ve always been very reserved and almost afraid to talk to strangers, for fear of sounding dumb or coming across as odd. Since Dad’s death, I have a new boldness and a desire to share with others what’s truly important in life: a relationship with Jesus. I often wonder if it’s harder to lose a loved one instantly and tragically as we have or slowly and painfully, from a disease. I think to myself that I would give my right arm to be able to tell my dad goodbye, to give him one last hug and tell him how very much I love him. But if I had had to watch my big, strong, wise daddy waste away from a horrible disease or injury, I don’t think I could have endured it. Even in tragedy, God is merciful and kind. I’ve prayed for Jesus to come back for His church many, many times since May 4. I’m ready to leave this earth; I’m ready for the pain and heartache to end. I wouldn’t say that I’ve been “depressed,” but I’ve had a desire to die since my dad was killed. In fact, several in our family have expressed these feelings, including some of our small children. Of course, I’m not thinking of killing myself, but I would be very happy for God to take me from this world at any time now. My husband thinks I’m nuts and tells me that I’m being selfish and that he and our children would be devastated. That’s true, I suppose, and I wouldn’t wish that pain on them for anything….I just want to be with my daddy again, and I’m tired of hurting. I can’t imagine living 40 or 50 more years on this earth without him. I don’t see how I possibly can. And then, there’s this: “I can do all things through Christ who gives me strength.” Philippians 4:13. I can because He gives. If God wants me to live 50 more years here, I have to trust that He will give me the strength. If He wants to take me Home tomorrow, I have to trust that He will give my loved ones the strength to bear it. He is enough. This world is not our Home. We are merely passing through. We are aliens and strangers on this earth. But our journey here needs to mean something. We have Kingdom work to do on our way through this life, and I believe that Jesus won’t be back for His church until we’ve finished the work He has given us. Life is hard. In fact, it stinks sometimes. But God is good. He is faithful. He loves us. And He’s coming for us soon. In the words of Matt Maher…..
Because He lives, every fear is gone. I know He holds my life, my future in His hands. Click here to see a glimpse of my dad’s beautiful life. What Good Are Dads, Anyway? I never imagined when I posted this piece last year on Father’s Day (see below) that I would be fatherless this year. Everything I wrote is still as applicable today as it was a year ago. I have to trust that my Heavenly Father will indeed be “a father to the fatherless” and “a defender of widows” for our family going forward (Psalm 68:5). In honor of Father’s Day, many of my Facebook friends have been changing their profile pictures this weekend to photos of their dads. I love to see all of the precious pictures of dads—some who are still with us and some who have gone on to heaven. There’s nothing quite like a father.